When chimneys fall into disrepair, they can quickly threaten the safety of your home. This checklist will help evaluate how adequately your chimney has been built and maintained over the years. 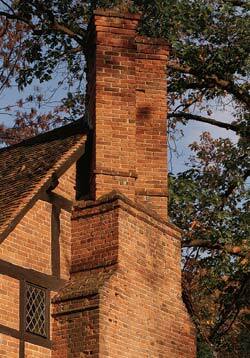 Chimneys and fireplaces are major architectural features, as well as part of the beauty and charm of old houses. When chimneys become faulty through age or abuse, however, they can threaten the safety of a building and its occupants. 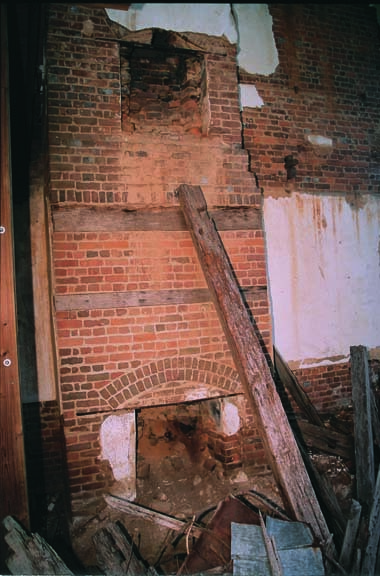 Evaluating the status of a chimney 80 or more years old is often a two-level process: first determining if it was built adequately, then examining how it is faring through seasons of use. Though large or seriously deteriorated chimneys are best inspected by a professional, there&apos;s much an old-house owner can do to size up the condition of a historic chimney. Chimneys that have been out of service for extended periods develop their own special problems. Before starting any fire, thoroughly inspect the chimney and hearth, using this checklist. If any condition is questionable, call in a professional. If the condition is good, move on to the Working Chimney checklist. Give the chimney an overall inspection for soundness. Check for cracks and settling at the foundation, weathering of masonry, or evidence that the chimney is moving away from the house. Look closely at the base of the chimney. The firebox should rest on thick reinforced masonry that extends into the earth. The hearth apron—in old houses usually cantilevered out in a half-arch--should be level and free of major cracks at the fireplace opening. Check for excessive leaning above the roofline. (Chimneys tend to lean in the direction of the prevailing wind, not because of actual wind pressure, but due to the effects of burning sulphur-containing fuels that increase the expansion of the mortar joints on the lee side of the chimney.) Minor leaning is more an appearance problem than a structural one, but if the chimney shows signs of cracking and imbalance, it may have to be dismantled to the roofline and rebuilt. Confirm that the chimney is at least 3&apos; higher than any roof surface where it comes through the building, and 2&apos; higher than any roof surface within 10&apos;. Shorter chimneys draw poorly or spew live sparks. 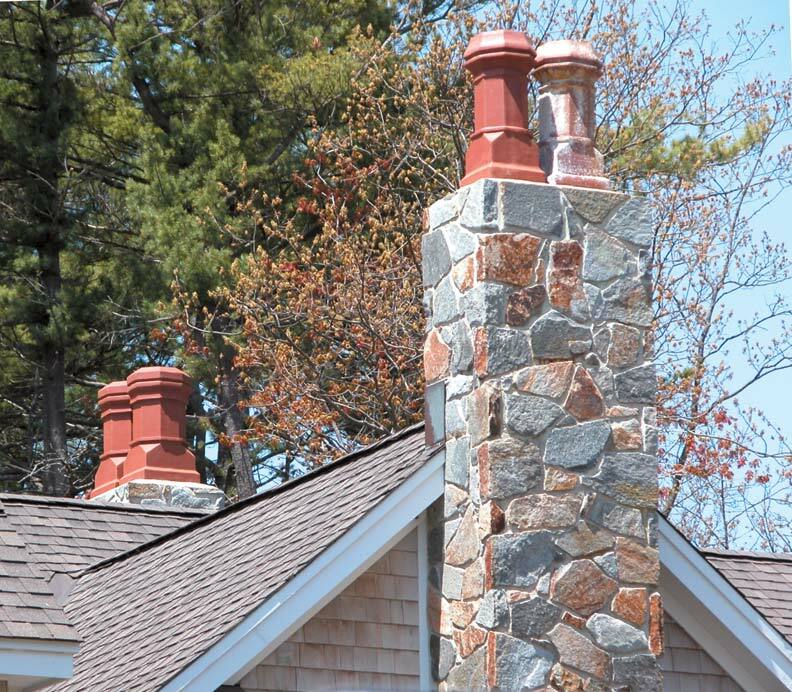 On exterior chimneys, inspect for weathering of the rack (where it expands into a fireplace). Racks may be protected with mortar wash, a course of paving brick, or a wide, flat stone. Mortar wash should fill each step of brick. Determine if the chimney is lined. While flue liners are required for safety by modern building codes, many old-house chimneys were built before they became common practice shortly after 1900. Unlined chimneys may have deteriorated mortar inside the flue and require a liner (see Working Chimney checklist, below). Check for obstructions. If the chimney is straight, sight up and down the flue to determine if it is clear. If the chimney has bends, use a smoke test (see Working Chimney checklist). Locate obstructions by tying a rope to a heavy object (a window sash weight is ideal), then lowering the object down the flue until the rope goes slack. Measuring the amount of used rope indicates the distance to the plug. To clear the plug, cover all fireplace openings then try drawing the object up a few feet and dropping it on the obstruction until it breaks up. 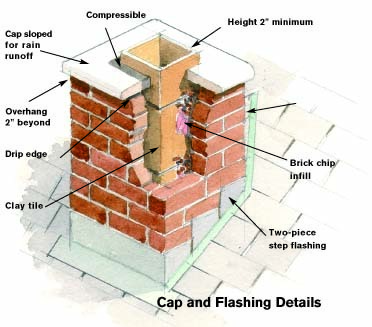 Persistent blockages (such as clusters of fallen bricks) may require you to break through the chimney wall. Check the flue for mixed uses such as electric wires, pipes, television cables, and other service lines that have been run up the chimney while it was out of service. Such surprises must be relocated before the chimney can be recomissioned. Check for poorly patched holes in the masonry, such as breaches repaired with brick pieces and wadded aluminum, or an unused stove thimble sealed with a metal "pie plate" cover. Either case may be wallpapered over, leaving telltale bulges as clues to their location. Such dubious seals can leak dangerous flue gasses or blow out during a chimney fire, letting smoke and flames into the room. Check for a cleanout door at the base of the chimney. These doors are essential for cleaning and maintenance, but were never included in many old chimneys. Doors should be made of iron or other fireproof material and must seal tightly when closed. Check inside the cleanout door. Soot, leaves, twigs, and nesting materials are normal in an unused chimney, but large deposits of old mortar and fallen brick may indicate deteriorating masonry. Check the throat (or top) of the flue for a damper. These devices reduce heat loss and aid fireplace efficiency, but many pre-1900 chimneys were built without them. Check damper operation. Debris often collects on top of closed dampers in unused chimneys and prevents them from opening. To remove clogs, begin by digging around slots in the damper with a long tool, raking out soot and dirt. The process is messy, but eventually you will excavate a hole through the debris, creating a draft through the flue that will help draw away dust. Make sure there is a minimum clearance of 2" between the firebox opening and the mantel, trim, or any combustible material. Also look for a minimum 2" clearance between flue masonry and framing of wall and ceiling. Inspect the chimney cap. There should be an expansion joint between the cap and any flue liner. A cap that is cast or mortared directly to the liner often cracks or works loose because the liner cannot expand and contract. Also the cap should be properly constructed with an overhang and drip groove to shed water. Chimneys that see regular service should be inspected once a year. Spring is recommended because the heating season is over and warm weather lies ahead for making repairs, but the byproducts of burning are still fresh and have had little time to corrode metal and mortar. Check for cracks in the chimney; they may indicate failing masonry and leak dangerous gasses and flames. Visually inspect the chimney on the exterior and interior surfaces. 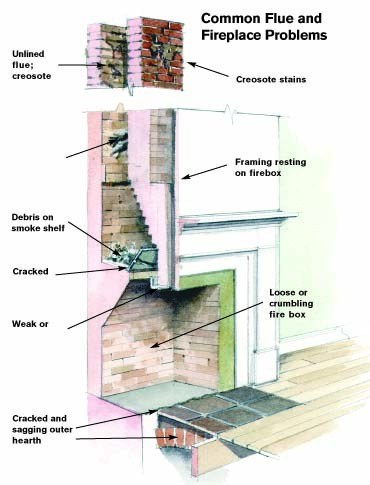 To evaluate chimney integrity perform a smoke test: 1) close all known openings in the chimney, including the top; 2) place a smoke source (a small, smoky fire or a smoke bomb made for the heating trade) in the fireplace; 3) look for leaks—quickly identified by plumes of smoke seeping through the mortar. Probe the exterior mortar joints with a pen knife. If any mortar is loose, crumbling, or more than 3/4" falls out easily with digging, it may be letting water into the flue. Check the condition of the interior mortar joints. Look up the hearth with a mirror or through a stovepipe thimble. In an unlined chimney the corrosive action of burning byproducts literally erodes the masonry from the inside out, leaving half-empty mortar joints on the flue side. The remedy is to have the chimney relined, usually by a contractor employing one of several commercial processes. Check the chimney above the roofline for deteriorated flashing or open caulking where it meets the roofing. Look in the attic for stains on rafters or ceilings—evidence of leaks. Check the condition of the cricket, a tentlike flashing between the chimney and the uphill side of the roof. Seal open joints with a good grade of butyl, silicone rubber, or polyurethane sealant compatible with the particular flashing metal. Check the cap for signs of heat cracking, storm damage, or weathering. Check the condition of the flue liner. Clay tile liners, widely used since the 1910s, can crack or separate, sometimes as the result of a chimney fire. The combustion byproducts of new high-efficiency heating plants and gas appliances may also affect them. Masonry and metal liners are newer but should also be examined. Examine the flue for soot or creosote bleeding through mortar joints. Investigate hidden areas, such as attic and storage areas, as well as living spaces. Faulty liners and mortar joints are usually to blame, but creosote buildup inside the chimney is also likely and a problem. Operate the damper and make sure it functions smoothly. Check for worn or missing cotter pins that link moving parts and replace them if necessary. Examine the base plate and anchoring mortar; if cracked or missing, repoint with refractory mortar. Examine the ash pit and empty it of ashes. Clean the flue of soot and creosote buildup. This is usually a professional job, especially if the chimney is very dirty or hasn&apos;t been cleaned in a long time. Many chimney-cleaning brushes and devices are on the market, but the basic process remains the same: brushing soot and other combustion wastes off the flue walls from the top down, then vacuuming up the residue from the hearth and smoke shelf. Check the smoke shelf for soot and debris, especially after cleaning. - Inspect stovepipe thimbles (and any stove installation). Thimbles should never protrude into the flue space where they will impede the draft, but they should extend fully through the chimney wall and stop flush with the inside surface. Where wood or coal stoves are installed in fireplaces, the connector pipe should continue inside the chimney at least to the beginning of the flue liner. However, stoves should not be installed in chimneys where the cross-sectional area of the flue is more than three times the cross-sectional area of the stove pipe. Do you need more information on historic hearths? 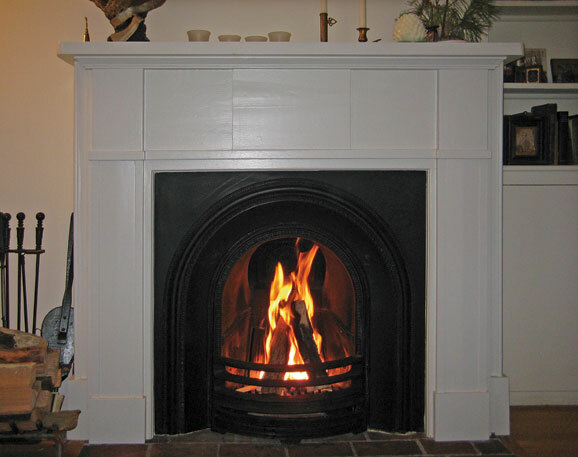 Compliment your old home with a reproduction fireplace.